Not an uncommon bird, but hard to spot. This is my first sighting since we moved to Florida. I went for a walk at Haney Creek yesterday late morning. I kept track of the birds I saw and heard and posted an eBird checklist for the first time in a while. 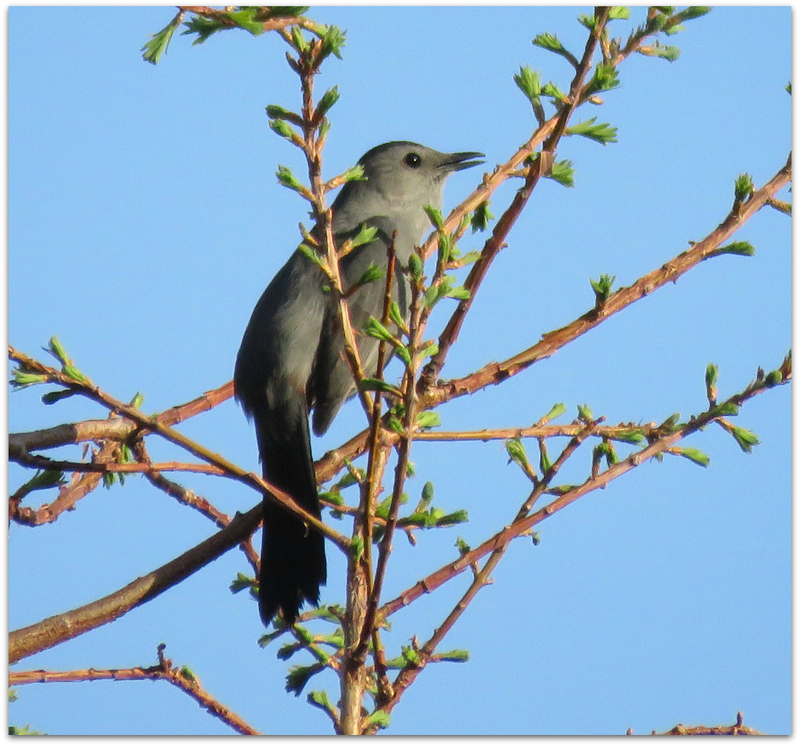 The first to greet me: a couple of Gray Catbirds. A slow-moving Gopher Tortoise was grazing at the edge of the path. On the fence at the dog run, an Eastern Phoebe. I expected to see more wading birds in the wetlands but only came up with this immature Little Blue Heron. That is a school just beyond the wetlands. The Little Blue is starting to get its adult colors. Why do they start off white and turn slaty blue-gray? I don’t know. Last time I was at the dog park at Haney Creek (two days before), there were a pair of Sandhill Cranes and a pair of Great Egrets having a turf battle. I did not have my camera. I was hoping to see them this day but no luck. Next I walked a trail through sand pine scrub. There were little birds calling but I only got a good look at a few, including this Yellow-rumped Warbler. There have been a ton of butterbutts around this winter. I’m almost getting sick of them. More info on Florida sand pine scrub, an endangered subtropical forest ecoregion. Another gopher tortoise out for a stroll. Finally an animal that can’t outrun me, or fly away. Lots of Northern Cardinals around. I think it’s nesting season for them. Chestnut cap helps identify this (out of focus) Palm Warbler. Who doesn’t love a Green Heron?? This entry was posted in Uncategorized and tagged Eastern Phoebe, Florida birds, gopher tortoise, Gray Catbird, Green Heron, Little Blue Heron, Northern Cardinal, Palm Warbler, sand pine scrub, Yellow-rumped Warbler on March 12, 2018 by Amy. Gray Catbird perches on the birdbath behind Audubon of Martin County yesterday at the Possum Long Nature Preserve in Stuart, FL. I am still learning year-round vs. winter residents. Looks like catbirds are snowbirds in Florida. Resident along the Atlantic Coast; otherwise migratory. Catbirds from across North America spend winters along the Gulf Coast from Florida through Texas and all the way down Central America and the Caribbean. They would arrive at our old house in coastal New Hampshire in early May, when tree flowers were blooming and insects were out. Contrary to popular opinion they were not shy. 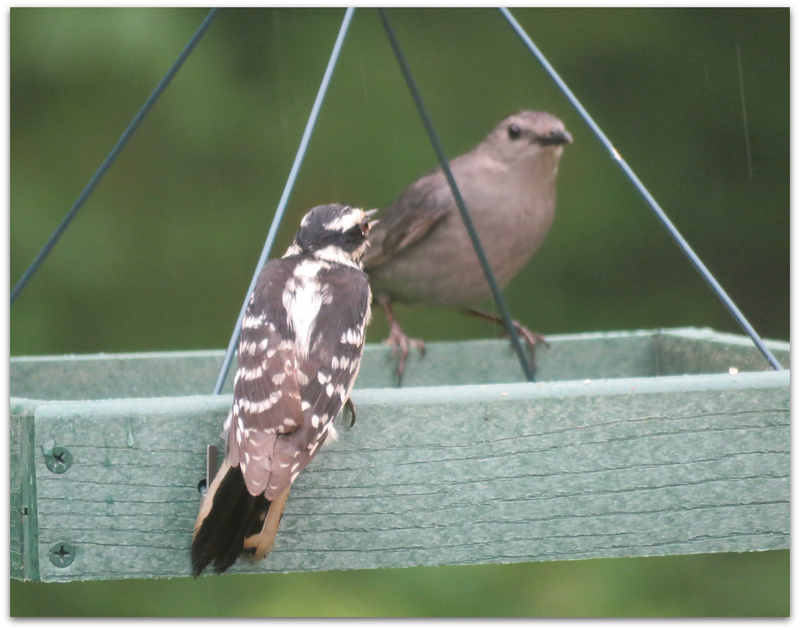 But I did serve them a fine feast at the feeders. 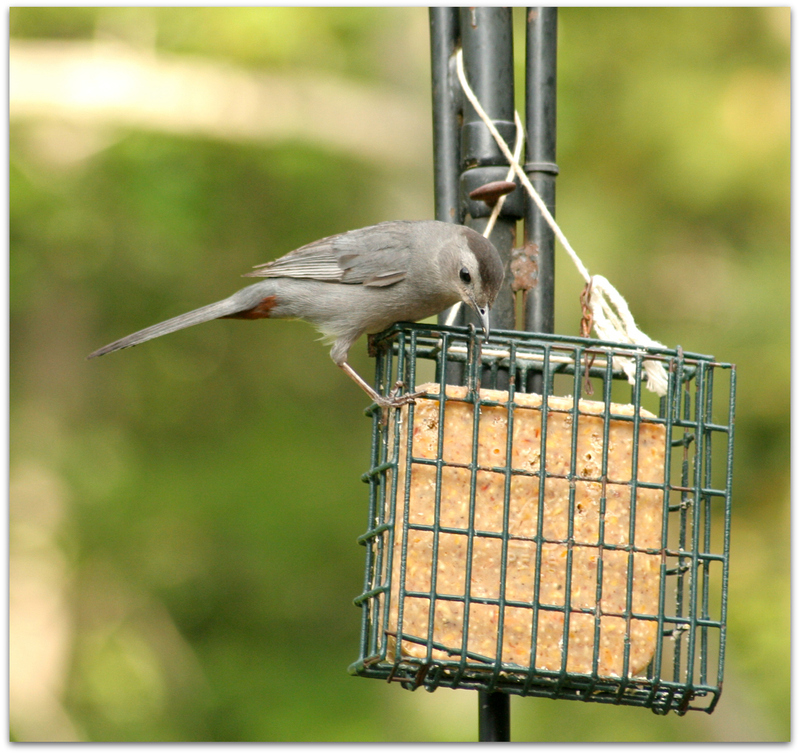 Scroll down for catbird photos from days of yore: GRAY CATBIRD – Amy’s Birds. 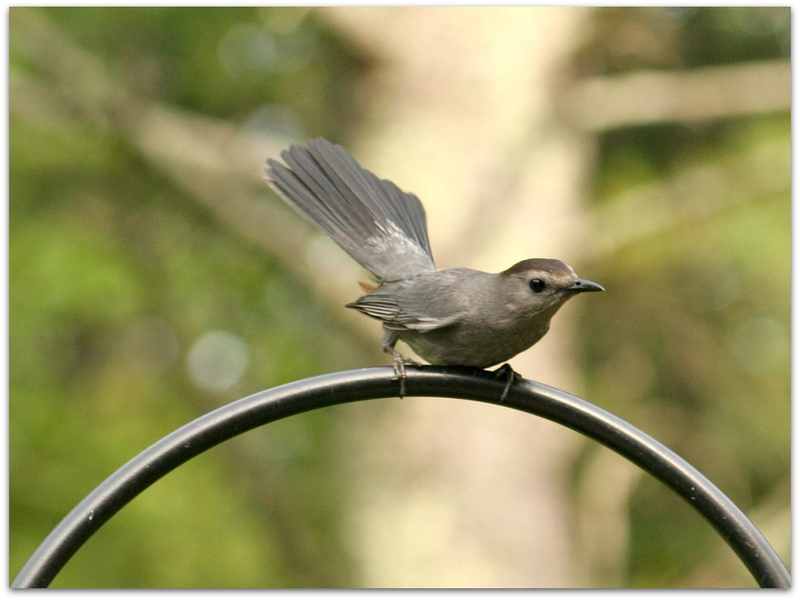 Catbirds are mimids, members of the Mimidae family which includes mockingbirds and thrashers, notable for their vocalizations and ability to mimic other birds and outdoor sounds. 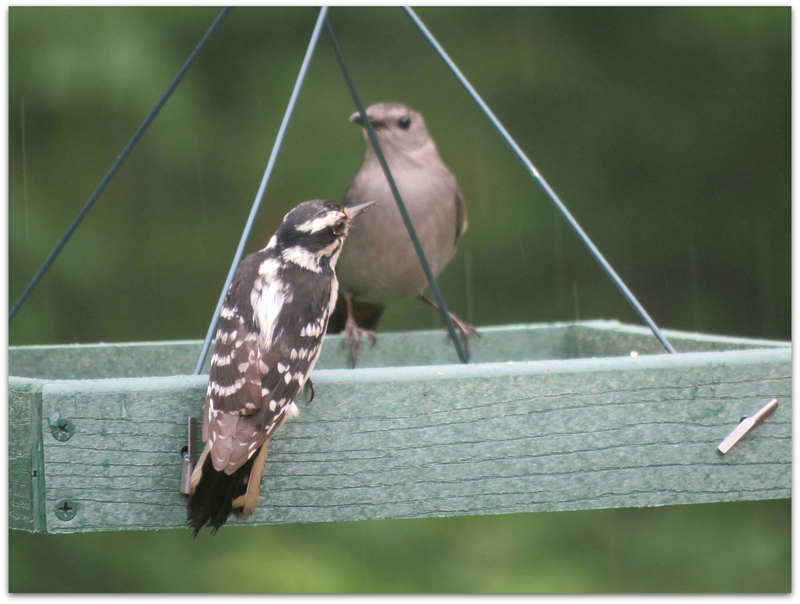 Yesterday I attended an Audubon class on Songbirds and Woodpeckers. 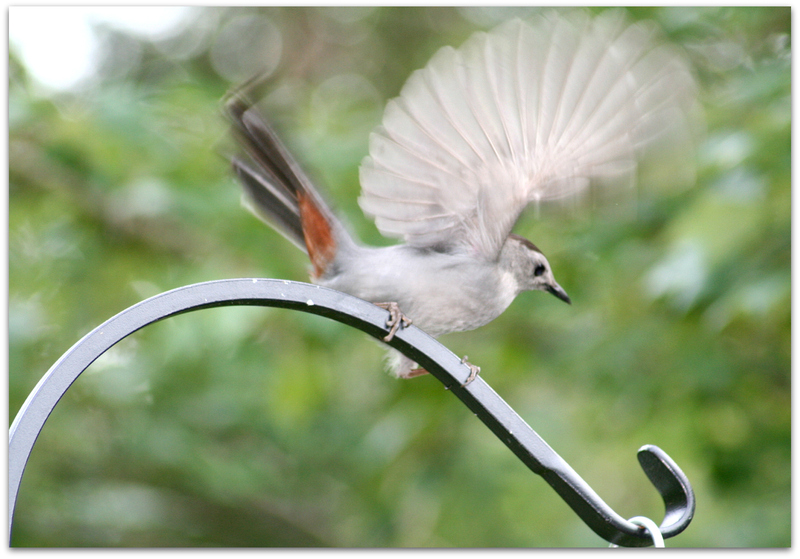 Catbirds are songbirds or, more scientifically, Passeriformes or perching birds. Of the 10,000 species of birds in the world, about half of them are “songbirds” possessing the vocal cords and brains that allow them to sing, not just vocalize or call. 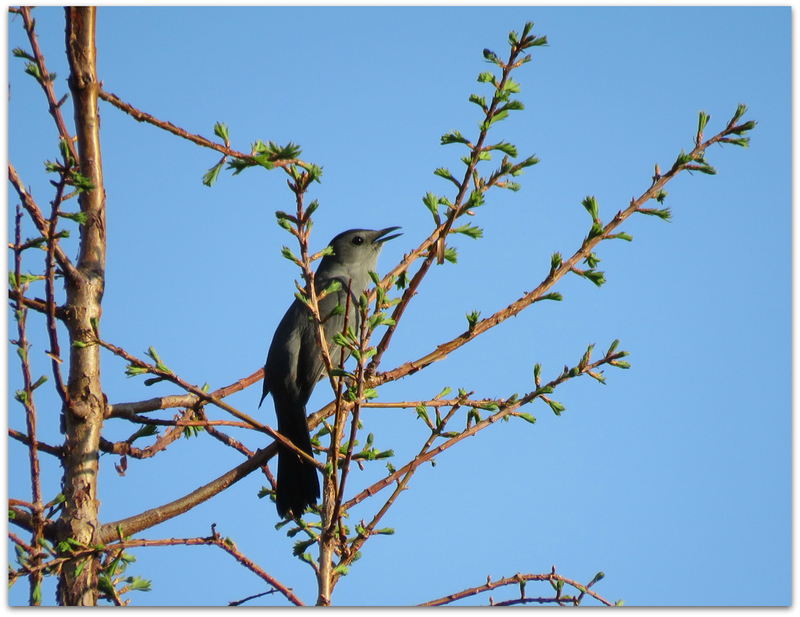 From Cornell Lab Bird Academy: How and Why Birds Sing. I went outside to get the Sunday paper during this morning’s dawn chorus and heard and saw two noisy catbirds in the bushes across the street. 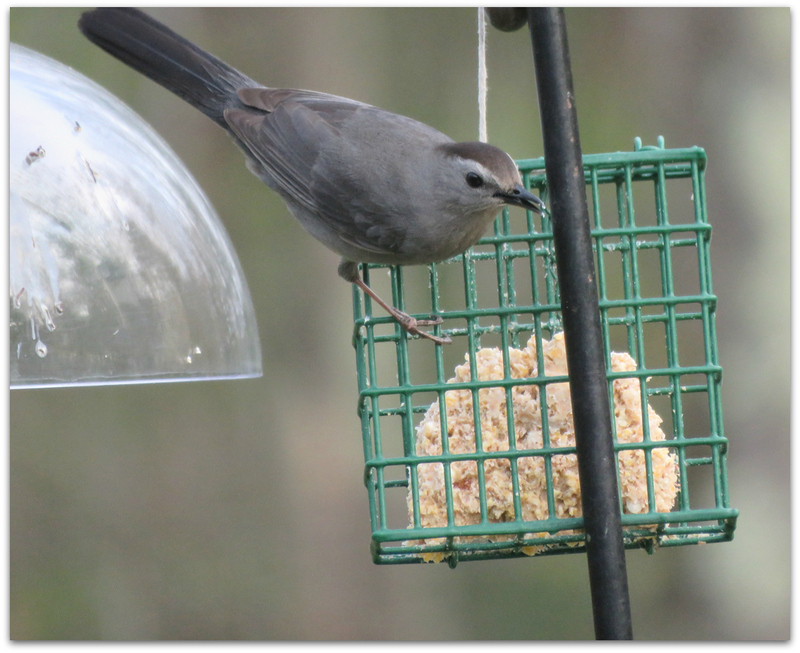 This entry was posted in Uncategorized and tagged birds, Florida birds, Gray Catbird on March 11, 2018 by Amy. Catbird not a morning person. It was chilly this morning, but not full-on winter-fluff chilly. Maybe this bird is molting? This entry was posted in Uncategorized and tagged backyard birds, birds, Gray Catbird on September 26, 2016 by Amy. I put out some oranges, impaling them on nails in a board. No orioles yet, but the catbirds seem to like them. 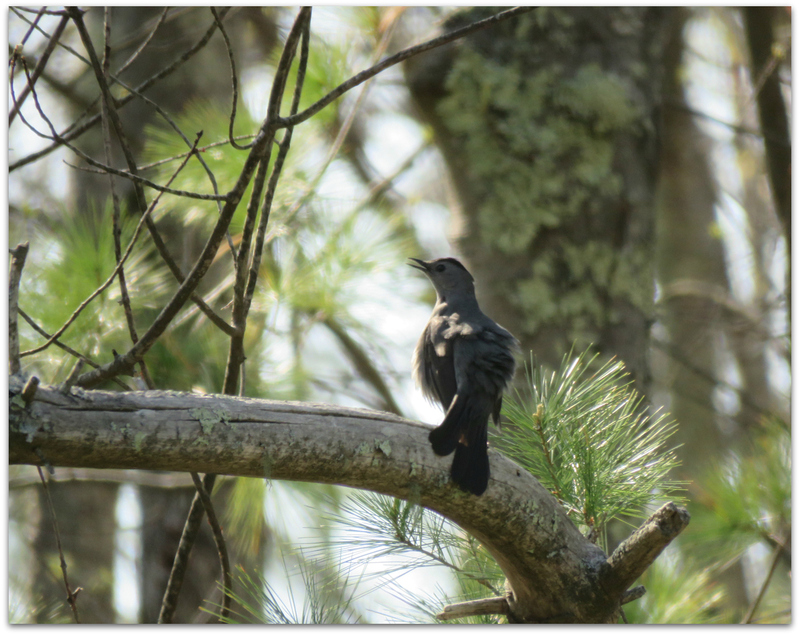 This entry was posted in Uncategorized and tagged Gray Catbird on May 14, 2015 by Amy. 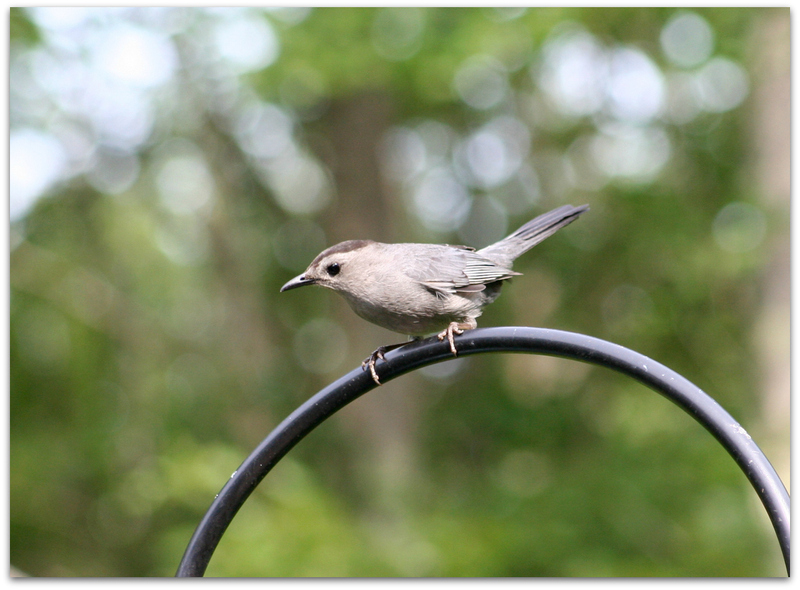 This entry was posted in Uncategorized and tagged birds, birdsong, Gray Catbird on May 10, 2015 by Amy. 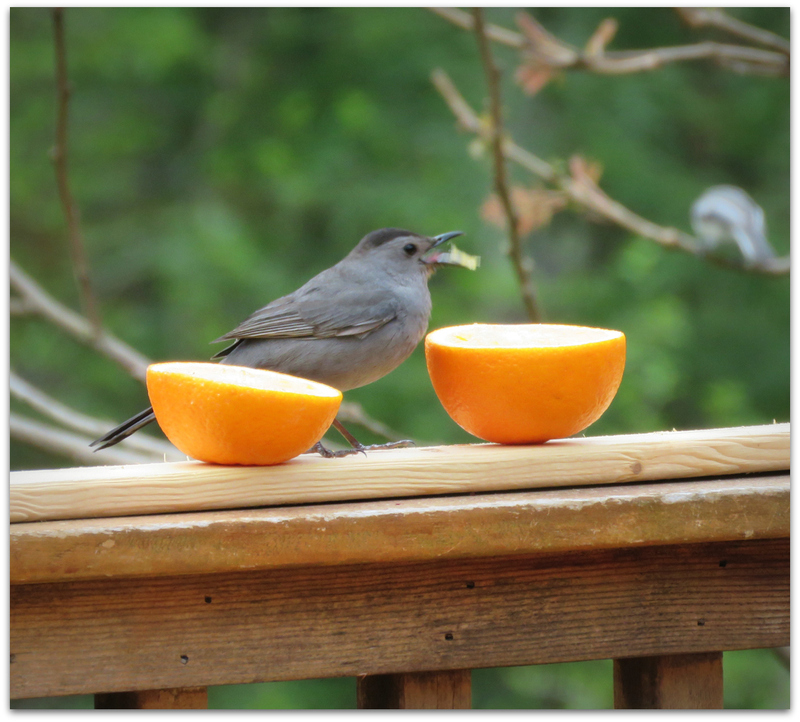 A couple of days ago the catbirds came back. 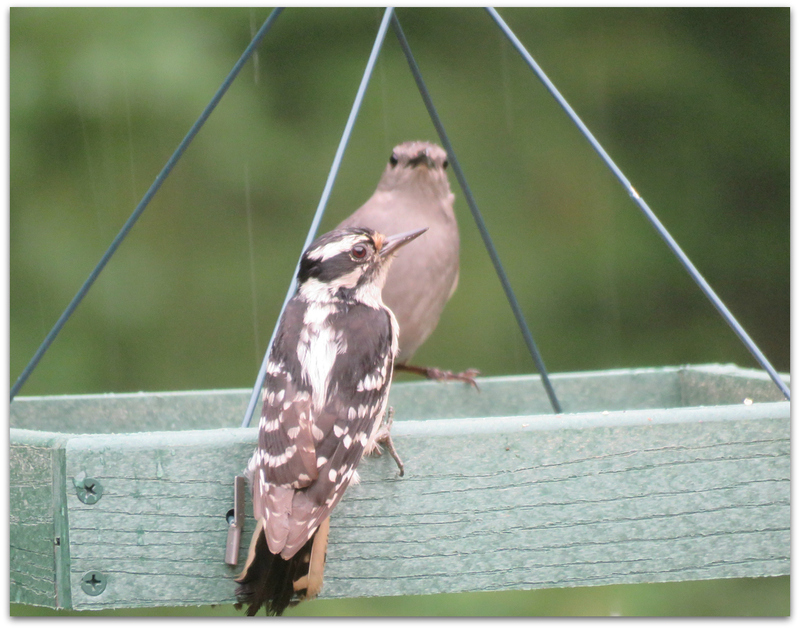 Shy at first, they are growing bolder – making acrobatic forays to the suet cakes and observing our behavior. We are quickly being classified as reasonably harmless food providers. 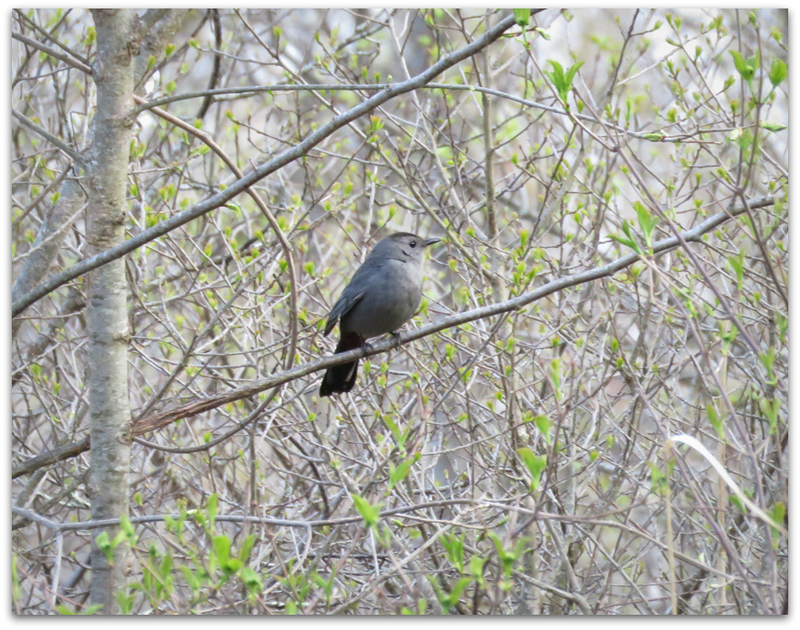 This catbird is pictured out past the pond and big garden, at the beginning of the red maple swamp woods. They do seem to like this area, I remember from last year too, maybe because there are winterberries growing wild there. I saw 5 or 6 catbirds yesterday. Maybe some are just passing through. 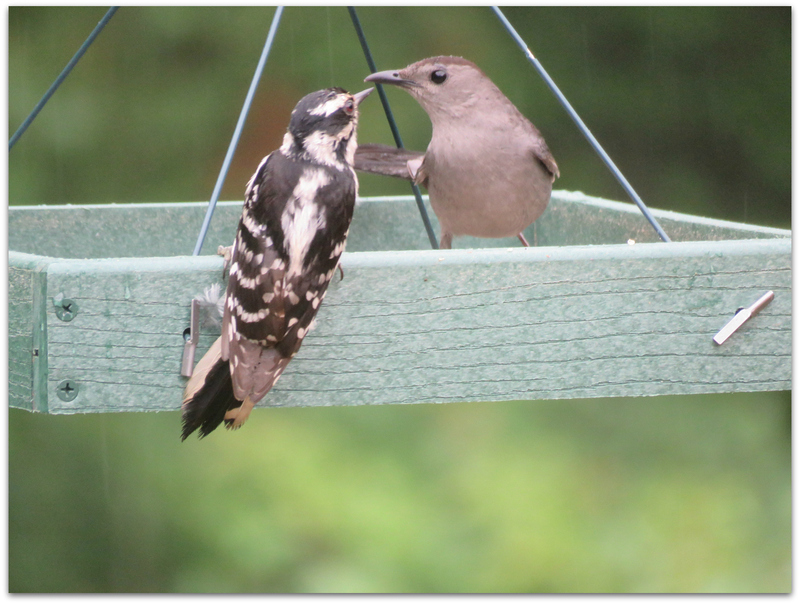 Last year we had a couple of pairs that nested nearby and visited feeders regularly. I heard catbirds before I saw them. Their “catty mew” is distinctive. 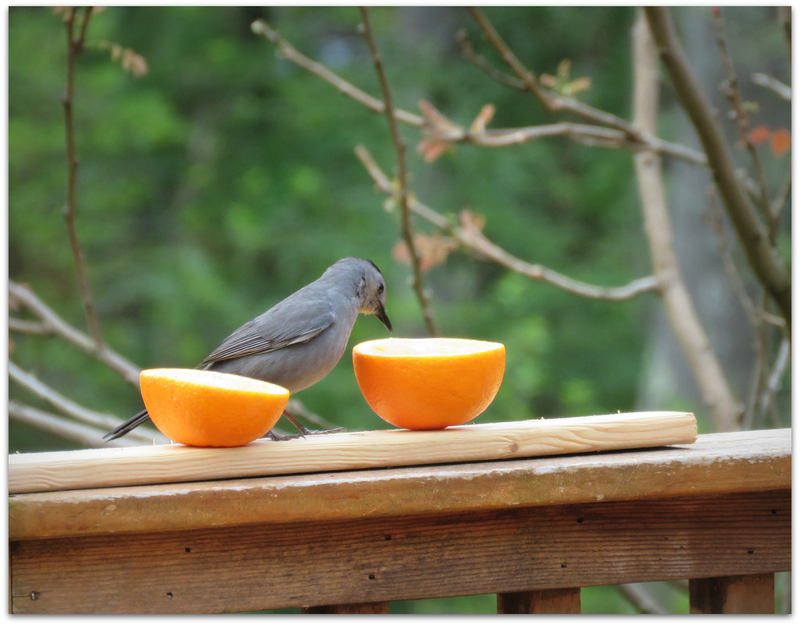 This entry was posted in Uncategorized and tagged birds, Gray Catbird, spring migration on May 9, 2015 by Amy. 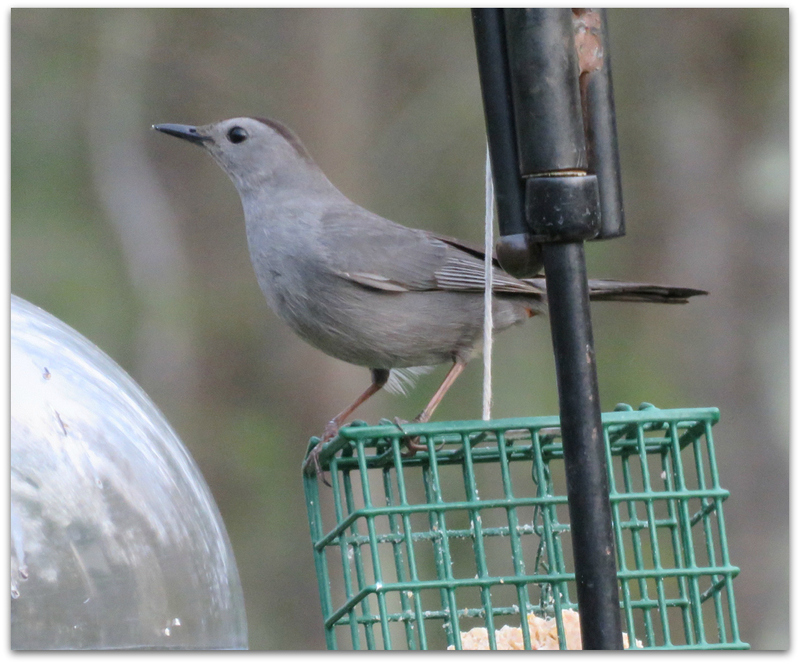 Gray Catbirds visit in the early evening. They are here for food. 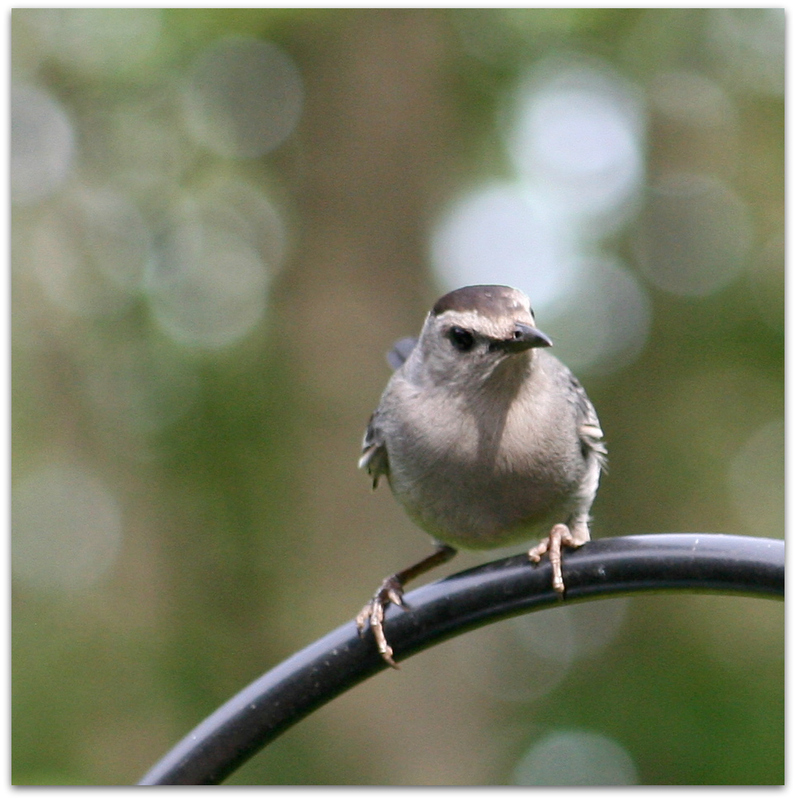 This entry was posted in Uncategorized and tagged backyard birds, birds, Gray Catbird on July 2, 2014 by Amy.